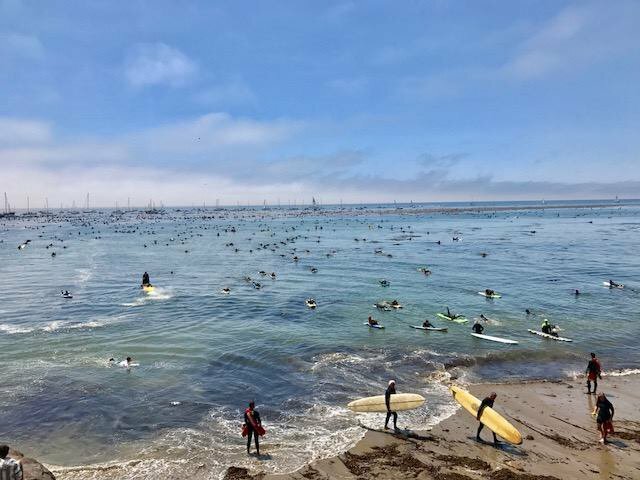 Last month, “surfing” was named the official sport of California! 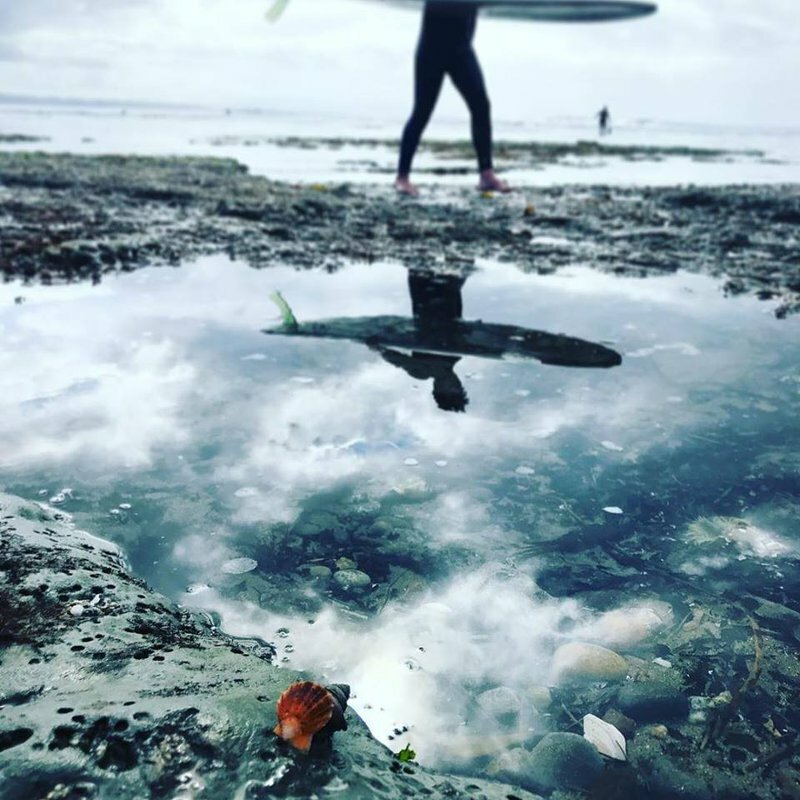 Santa Cruz is well-known for its surfing and surf culture and is one of the best places for surfing worldwide, and you’re in luck because Santa Cruz is one of the best places to travel in the fall as well, so put it on the list because it might be time for a Santa Cruz family vacation. The weather gets warmer in September and October and the waves get bigger. With a number of sandy beaches and breaking waves perfect for riding, Santa Cruz is one of the best beach destination on the West Coast and has waves for both beginners looking to learn and for experts searching for the next big wave! And if you just want to watch from the sidelines, that’s cool too! 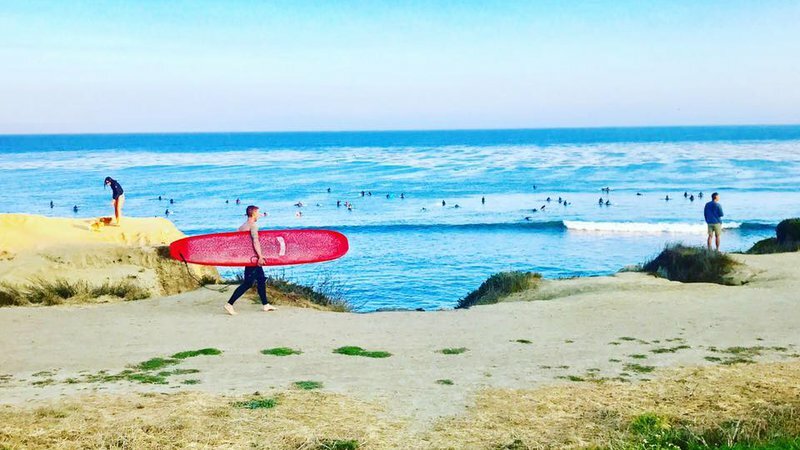 We’ll let you know the best places to learn surfing in Santa Cruz, the best places to watch surfers in Santa Cruz and the best spots to experience Santa Cruz surf culture on your next Santa Cruz getaway. Next up, is a visit to the Santa Cruz Surf Museum located in an old lighthouse on West Cliff Drive. Take a look at all the surf photos and other memorabilia and enjoy views of surfers at Steamer Lane. This is a great place to learn surfing in Santa Cruz, research the greats, observe the records made and legends created in Santa Cruz. Which brings us to our first great surf spot, Steamer Lane. This spot it for more experienced surfers so it’s not recommended to start here if you are a beginner. But it is a great place to watch surfers in Santa Cruz and really see how it’s done. Grab a coffee nearby and take it over to the cliffs by the lighthouse, you can almost get a bird’s eye view of the surfers down below. Watch closely as they dart through and glide over wave after wave, the site is mesmerizing. The other great thing about this spot is that it offers spectacular sunset views and is nearby the Santa Cruz Beach Boardwalk Amusement Park, so after an afternoon watching the surf, head over to the wharf for some clam chowder, followed by a ride on the Giant Dipper! The next surf spot on our list is Cowell Beach. This is the place to go if you are on a Santa Cruz family vacation and you the whole gang wants to learn surfing together. This surf spot is known for long, gentle waves that are easy to catch. It’s also great for longboarders and stand up paddle boarders. If you sign up with a surf school this is most likely one of the places they will take you to learn. However, because of this it does get crowded on weekends and holidays so plan ahead! Down West Cliff Drive, you’ll find Natural Bridges, probably one of the most beautiful beaches in Santa Cruz to surf or watch. The conditions are usually great and the views are breathtaking. Another reason Santa Cruz is one of the best places to travel in fall, in October the monarch butterflies come to Natural Bridges State Park and you’re able to see hundreds of fluttering monarchs float gracefully through the trees. Definitely a must see on you Santa Cruz vacation. Now it’s time to head over to East Cliff Santa Cruz and explore the Santa Cruz surf spots on the other side of town. 30th and East Cliff is a great spot for experts looking for a challenge, but any beginner should definitely sit this one out and enjoy this spot as one of the best places to watch surfers in Santa Cruz. Trust us, the folks surfing here have got to know a thing or two an have been surfing for awhile, the swells are aggressive and the waves are short and good for advanced tricks. On a good day, you can usually see tons of people lining the shore to catch a glimpse of the surfers. Rounding out the list we have Pleasure Point and The Hook. Eastside Santa Cruz is a beautiful place to spend your Santa Cruz vacation and these beaches are some of the best around. Pleasure Point is definitely one of the most popular surf spots in the area, and a must see on your Santa Cruz getaway, whether you’re surfing or not. It offers a variety of waves for both beginners and experts. This one drives a lot of crowds so following the surf etiquette is a must. The Hook, which is nearby is another great surf spot in Santa Cruz. To get to the hook, you descend a giant flight of stairs at the end of Pleasure Point. The surf spot got its name from the amount of kelp that got hooked on things in the water. This spot is also pretty crowded and popular with the locals but a good spot to either watch or learn. The last spot on the list is in Capitola at Capitola Beach! Capitola Beach is without a doubt the perfect spot for learning how to surf. It’s family friendly and the waves are mellow so it’s offers a stress free and beautiful environment for picking up surf skills, the area also has tons of safe and family friendly restaurants and shops so it make a great side destination for a Santa Cruz family vacation.